MODEL ST101 — ONLY $2150.00! • Tubs can be disassembled to 32” to fit through small doorways. • 260 lbs. ship weight about 300 lbs. 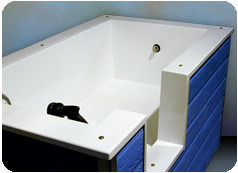 • This tub is mounted on a pressure treated kick plate recessed for comfort. • More compact, using up less shop space, dog needs to be turned during bathing. • Enclosure and frame work have a one year warranty. Siding and plumbing fixture are covered by manufacture siding 30 year, shower valve 5 years. • Please use our Quote/Order Form for shipping cost.